My dad is a big tea drinker and the tea cozy he's used my entire life is on it's last legs. He asked me to make him a new one, leaving color and fabric and design completely up to me. 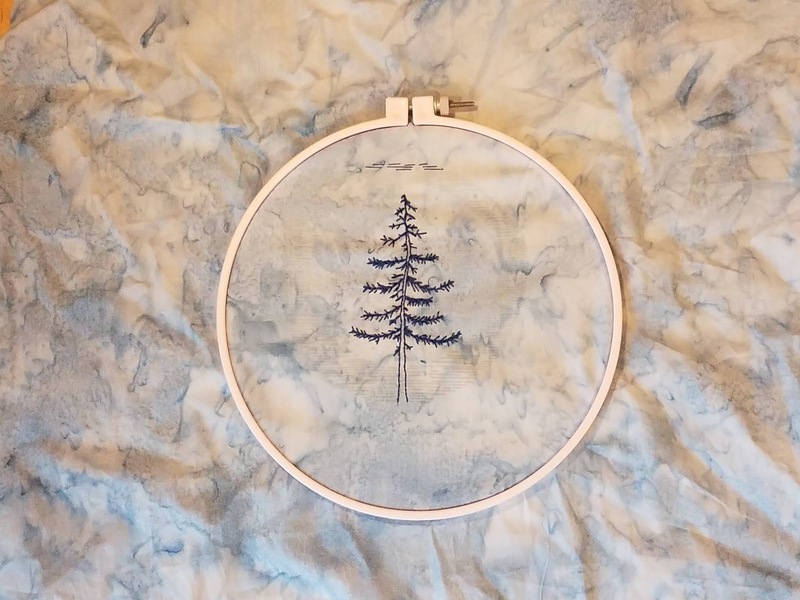 I found a great embroidery pattern from Cozy Blue Handmade that I think he will like. My One Monthly Goal (OMG) with Patty of Elm Street Quilts is to finish the embroidery. I'm currently planning to use the design on both sides of the cozy so I will need to stitch the design twice, but that plan may change. That's a very cute start! I love the embroidery! I can't wait to see it when you are finished. Very pretty. Love the blues, it's going to make a very nice tea cozy. Good luck! That is so pretty. Thanks for linking up with Elm Street Quilts and good luck on your project! That is a great fabric and thread choice for a tea cozy for your Dad. So pretty! I live with a tea drinker by the pot so tea cozies are a part of everyday life. How special to make one for your Dad. Happy Stitching! Great tree, it looks so real.